I'm nothing if not persistent, so here's another bug report. The HT EOPD sensor has two modes, Short Distance and Long Distance. These modes are activated by configuring the port and a sensorLightInactive and sensorLightActive respectively. 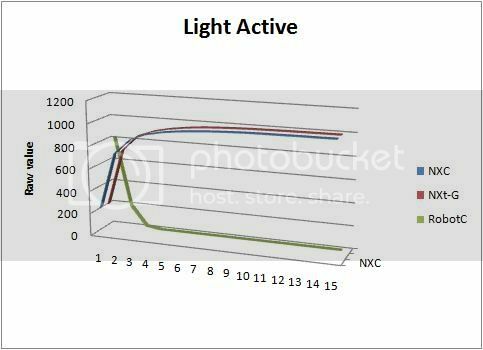 The results I get with the sensor in short distance mode are totally consistent with what I see in NXT-G (see post here: viewtopic.php?p=6378#p6378). However, when the port is configured as sensorLightActive, the readings are completely off. I did some testing with 3 programs, NXT-G, NXC and finally RobotC. The sensor was placed in the same position each time and the object that was measured against was moved along a delineated underground. Could one of the developers please respond to this? It is rendering the EOPD sensor unusable in Long Range mode. Sorry for the bump, but did this ever get resolved? My FTC team would really like to use the EOPD Sensor but we need the long range. We would also like to be able to use it on the multiplexer, but (if I recall correctly) the smux cannot send I2C write commands. We currently (using RobotC 3.54) cannot get the EOPD to activate long range mode while on the multiplexer. If you're using the driver suite, you should be using ROBOTC 3.55B2 and the Driver Suite 3.2. The issue in this thread has nothing to do with the issue you're seeing. The EOPD is not an I2C sensor, so the read-only aspect does not apply here, you can toggle dig0 on the SMUX just like you can on a direct connection.